Flat Bench Press: Beginners and those who are greatly increasing the weight they are lifting should be careful with this exercise. If possible, have a spotter help you through it. For this exercise, you should lie flat on the barbell bench with the barbell above you. Lift the barbell and push it up above you. With slow and controlled motion, bring the weight down to just above your chest. Repeat for the number of intended repetitions. 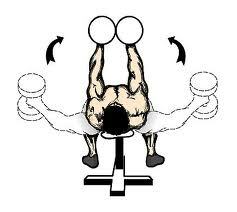 Also, consider doing this exercise on an incline or decline to work all sides of the muscles. Flat Bench Flye: Like the previous exercise, you will begin by lying on a flat bench, and you will need to have two dumbbells that are of an appropriate weight for you (one for each arm). Lift the weights so that they are above you, about a shoulder length apart. Then, slowly bring the weights back down to the sides, breathing at the same time. Repeat for the number of intended repetitions. Also, consider doing this exercise on an incline or decline to work all sides of the muscles. 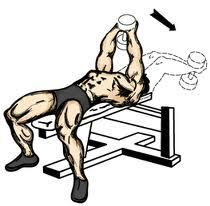 Cable Flye: To begin, you will need a flat bench and access to two pulleys (one on each side of you). Hold the pulleys with the insides of your hands facing toward the ceiling. Use your chest muscles to help you pull the pulleys upward so that your hands touch above you. Be sure to keep your feet planted during this exercise. Repeat for the number of intended repetitions. Consider completing this exercise on an incline as well. 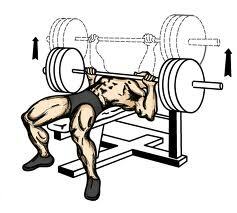 Pullovers: Begin by finding a flat bench and an appropriately-sized barbell. With your palms facing away from you, lift the bar above your chest. Then, slowly lower the barbell behind your head with a semi-circle motion. Bring the bar back up above your chest to complete the first rep. Repeat for the number of intended repetitions. 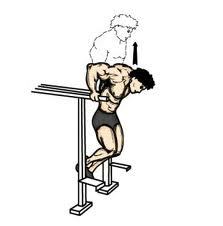 Chest Dips: This exercise requires the use of parallel bars. Facing outward, push yourself up onto the bars. Adjust your body so that you are lunging forward about 30 degrees (this is necessary to make sure you are working your chest rather than another body region). Holding the angle, dip down and lift yourself back upward. Repeat for the number of intended repetitions. Pushups: Pushups are convenient because they do not require any outside equipment. Place your hands and toes on the floor so that your body is hovering above. Lower yourself so that you are almost completely on the floor by bending your arms and supporting your body in a controlled manner. Then, raise yourself back up into your starting position. Repeat for the number of intended repetitions. These exercises provide for numerous ways to work your chest muscles accordingly. Try to include a variety of them within your workout so that you will be able to work all components of the chest region.